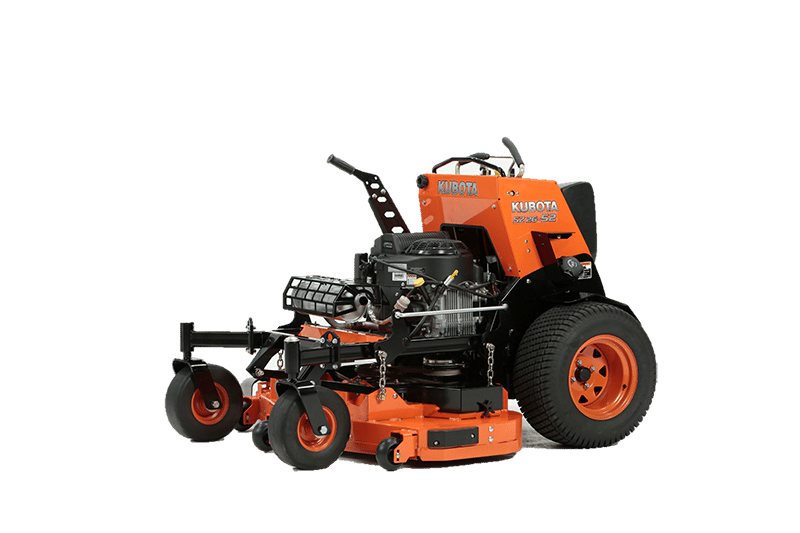 In this article, I want to show you the different models of stand on mowers available and discuss the pros/cons of whether a stand-on mower may be the best choice for you. Stand-on mowers have dramatically improved the way lawns are mowed. Before 1995 I was using Toro Groundsmasters and Jacobson Turf Cats, as my primary mowers. They would mow a lot of lawn but they were big, heavy and didn’t like small spaces or hills. Because of that the mowing crews also needed to have 36-60 inch walk-behind mowers, 21-inch push mowers, and multiple string trimmers. It was common for me to have crews of five to nine people. But that all changed in the spring of 1997. My local dealer convinced me to demo a new to the market stand-on Great Dane Surfer and a mid-deck Exmark Lazer Z zero-turn. By the end of the summer, I had replaced all of my equipment with these new mowers, reduced my crews to two or three people and they were getting more lawns mowed! 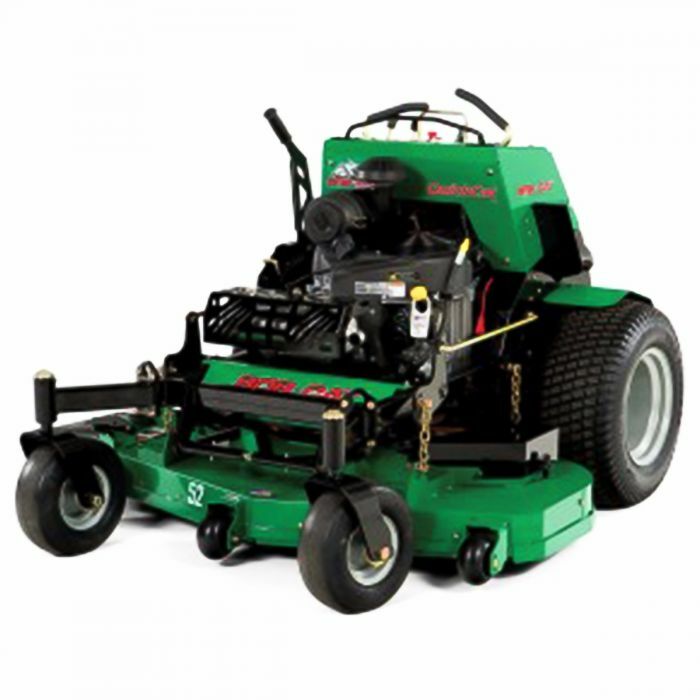 The new mowers quickly paid for themselves in reduced labor and maintenance costs. 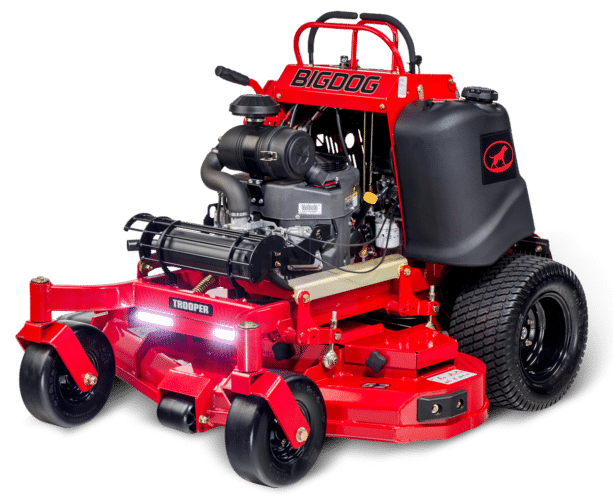 What is a stand-on mower? 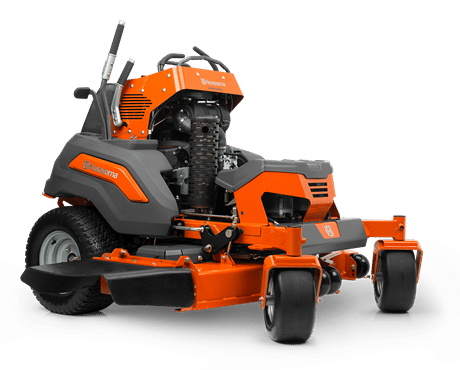 Stand-on mowers were born out of the need for a mower that was faster and more productive than a walk-behind mower yet lighter weight and more agile than sit-down zero-turn mowers. 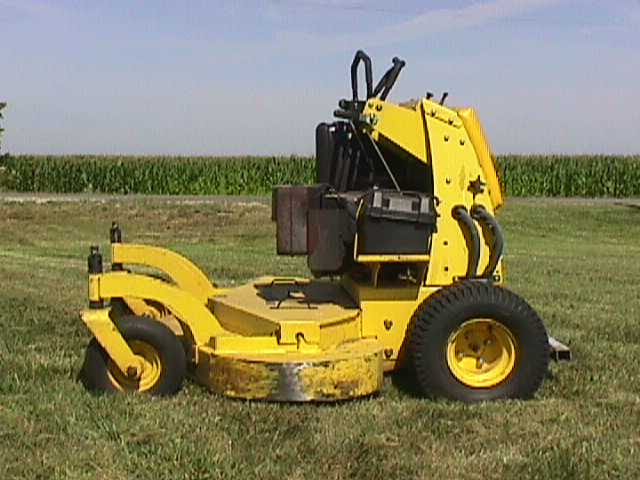 The first stand-on mowers used commercial walk-behinds as the template. Bill Wright, in particular, saw that he could move the controls up and over the engine and permanently attach the Velke (sulky) to the mower. The idea of the stand-on mower was born. About the same time, another individual in Florida was working on the same idea and Dane Scag saw the potential there. Dane Scag was the first to market with the “Surfer” stand-on but Bill Wright was the actual inventor/patent holder and spent another year engineering out all the bugs from the “Stander” before putting it on the market. As with any industry, it took quite a few years before established landscapers were willing to switch from “what they knew” to the new design of the stand-on. But the hard work and dedication to the idea finally paid off for Mr. Wright and it became accepted that stand-on mowers were much faster than walk-behinds and more efficient and lighter than ZTRs on smaller and medium size lawns. 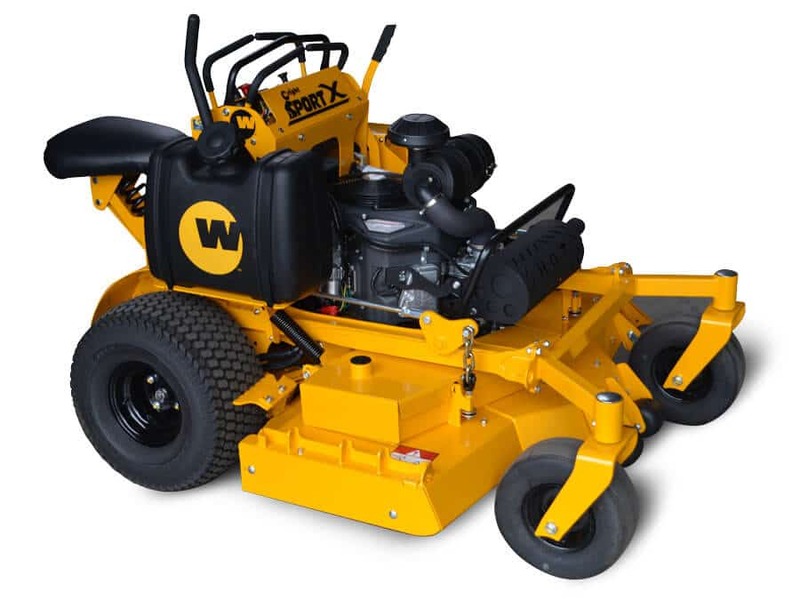 Today Wright Manufacturing not only makes the fast and agile stand-ons that excel on small to medium lawns but also larger and more powerful stand-on mowers that outperform many conventional sit-down ZTRs. 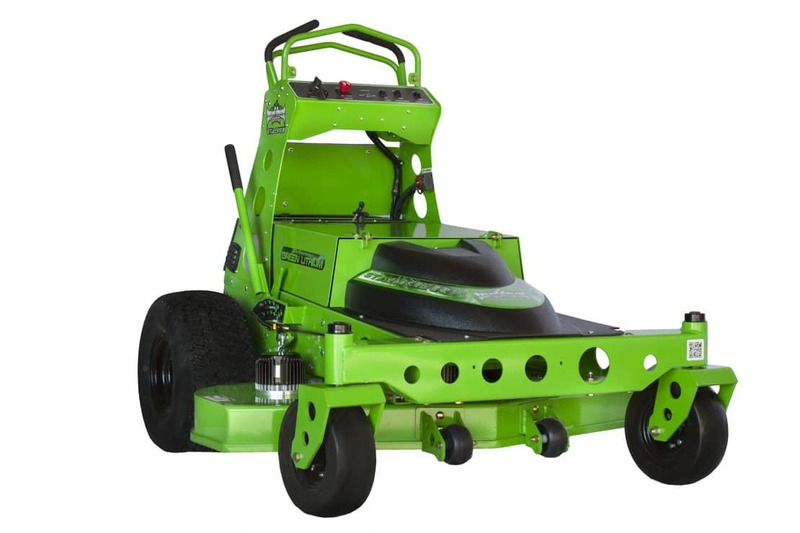 Stand-on mowers have become so popular that there are now over 15 brands competing for your dollars. Below is a list of Pros and Cons to help you decide if a Stand-on is the best choice for you. After that is a list of the 2019 manufacturers and links to their websites. 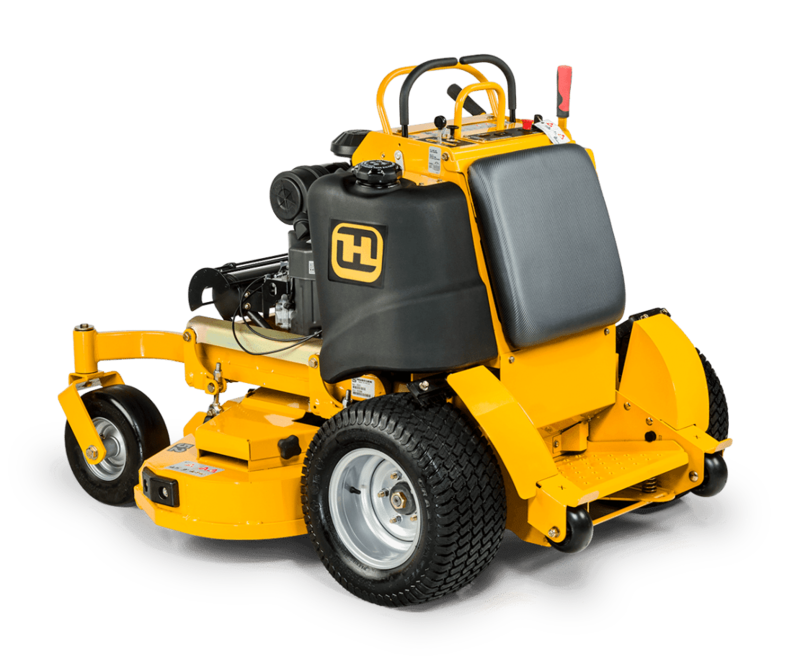 Finally, All the current stand on mowers are commercial grade designed for harsh use by landscape contractors. Even the cheapest model will last you many, many years. 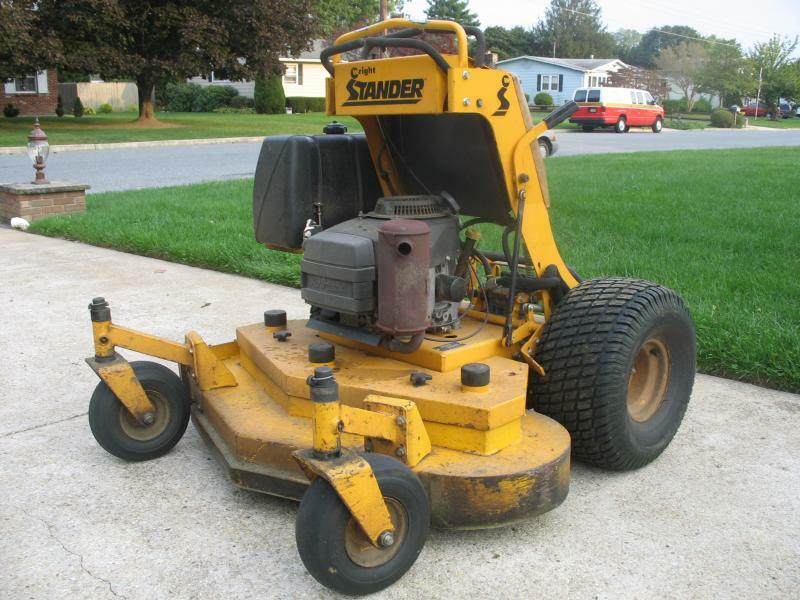 Stand-on mowers excel at mowing around landscaping, trees, and bushes. 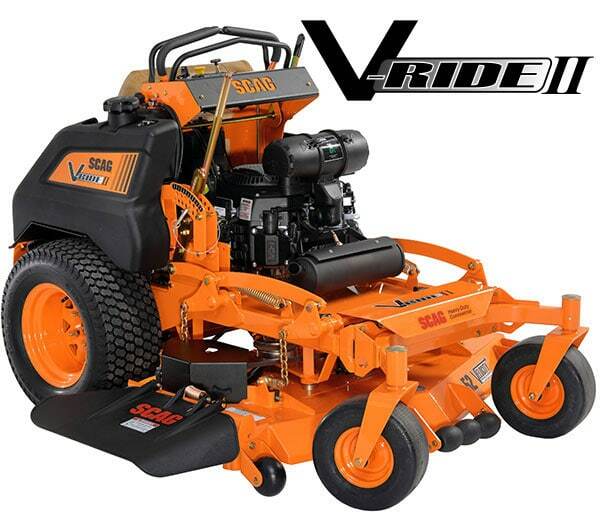 You stand behind the deck which gives you better visibility when mowing around intricate landscape beds. With a little practice, you can duck down when mowing under trees and bushes that would knock you off a conventional ZTR or lawn tractor. You have a natural and intuitive body position when operating a stand-on. Flex your knees and bumps and rough areas won’t wear you out. 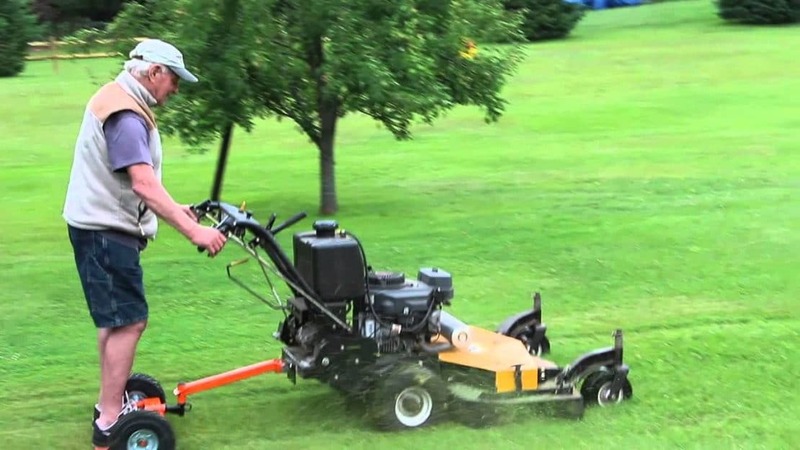 Standing when mowing allows bumps, vibrations, and jolts to travel naturally through your entire body and not just through your back and spine which happens all too often when you are seated on a ZTR or lawn tractor. If you are mowing rough, bumpy ground stand-ons are much easier on your back. Stand-ons turn better and have more traction when turning. With a conventional ZTR the engine is hanging behind the rear axle – with a standon there is nothing except the back of the operator behind the rear wheel and in many cases, the weight of the operators is centered over the rear wheels. The engine, battery, and fuel is between the front and rear wheels. With the majority of the weight centered on the mower, it has better traction and less weight to swing around. Since you are standing inside the rear wheels your body is also creating less inertia when turning. That means the mower turns better so there is less turf damage when you stop, start and make your turns. With practice, you can make the stand-on “dance” across your lawn without leaving one tear, rip or divot in your turf. Stand-on mowers are the best choice for mowing ditches and other areas too steep for residential ZTR’s and lawn tractors. They have a much lower center-of-gravity and you can shift your weight to counterbalance the machine on slopes. The 50 to 60-inch models have a wide stance so if the slope is too steep they just slide on the slope instead of tipping over. And the best part – if you get in trouble – all you have to do is step off the mower. Stand-ons dramatically cut down on unproductive time. If there is debris on the lawn all you have to do it stop, step off the mower and pick the trash up. Step back on and mow! Trimming is reduced and the time to trim even more. Stand-ons are more agile than other mowers so you can safely get closer to objects. In addition, get a cordless string trimmer and put a trimmer rack on the stand-on. No need to walk from one landscape area to the next. Just use the stand-on to quickly move around the yard. 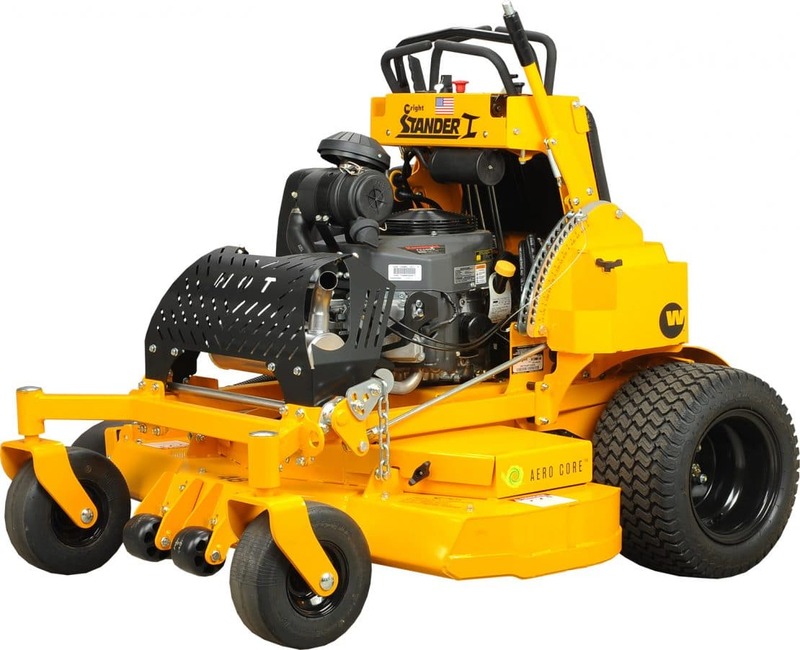 Stand-on mowers are typically lighter than conventional ZTRs. They reduce compaction, rutting, and divots on your lawn. They take up less room on trailers and in your storage shed. 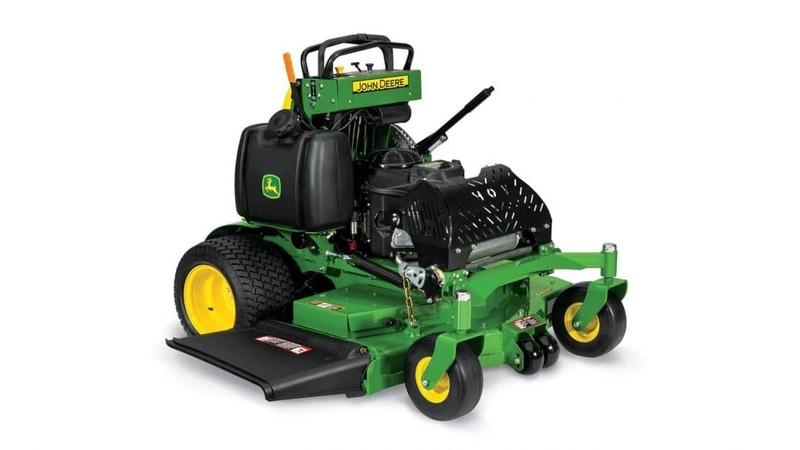 Three stand-ons will fit in the same area as two zero-turns or lawn tractors. 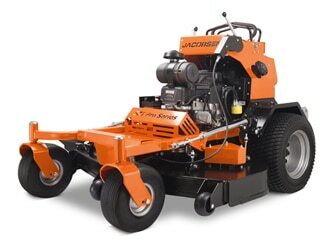 In summary, experienced landscapers like myself prefer stand-on mowers for small and medium sized lawns. After mowing lawns all day we all state our back is less sore, we are not as tired and we get a lot more done than using mid-mount ZTRs and lawn/garden tractors. They don’t bag. All of the current stand-ons cut grass better than residential zero-turns and lawn tractors. They all use deep decks so they also mulch better. All will mow at 4 inches or higher. But none of them will bag. There are no residential grade stand-ons on the market right now so they are more expensive than residential Zero-turns and lawn tractors. The least expensive stand-on starts at $4000. #Ryobi – I’d love to see you produce the first stand-on electric zero-turn for homeowners! They won’t pull your lawn trailer, dethatcher or roller. There are plenty of after-market manufacturers that offer front mounted, spreaders, sprayers, debris buckets, and string trimmer brackets. Small: 32-46 inches Gated communities and other small lawns with very few slopes. 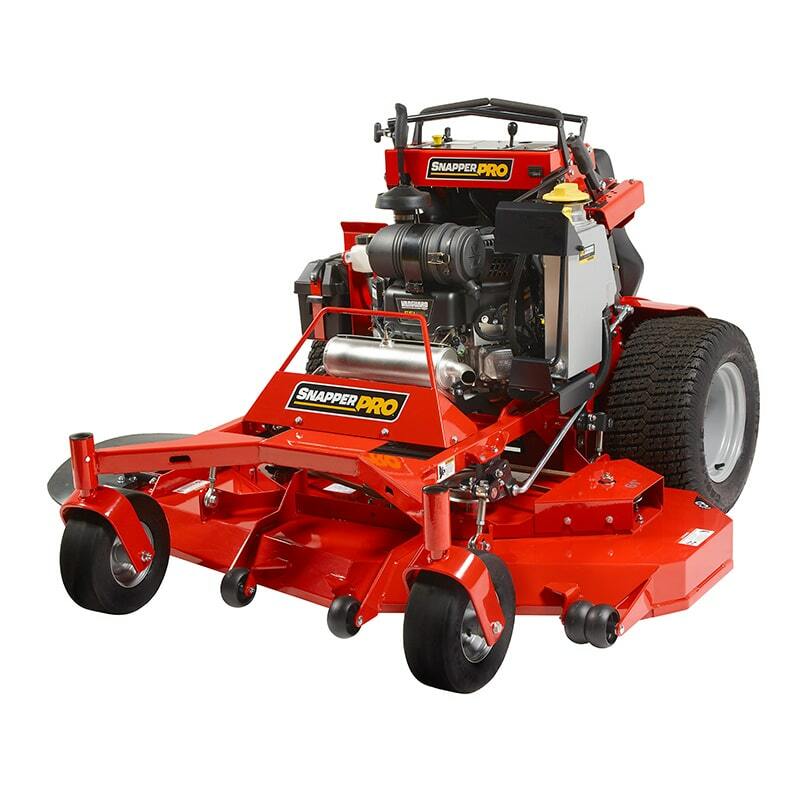 These mowers excel at mowing intricately landscaped properties. They are not designed for berms, ditches, and slopes. The Gravely ProStance 36FL is a good example of this class. 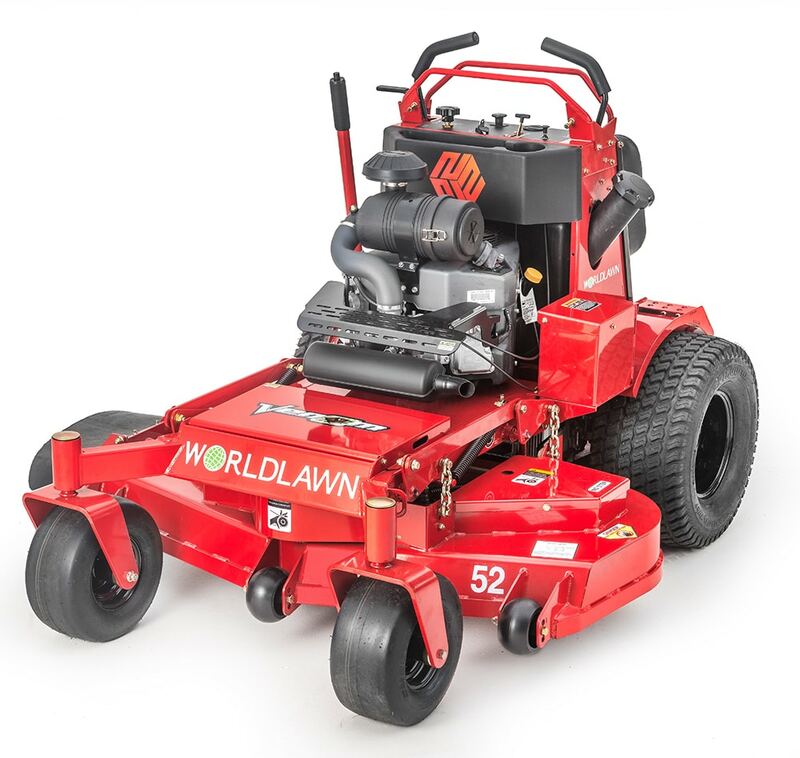 Medium: 48-60 inches Lightweight compared to most other mowers so they won’t leave ruts on soft turf. Because of their agility, these will easily mow more lawn in less time than conventional zero-turns. With a little training, you can mow slopes and berms with these mowers. Experienced landscapers always have two or three of these that are used for small and medium-sized residential/business properties. The Wright Stander B is a good example of this class of stand on mower. Large: 48-72 inches These stand on mowers are direct replacements to the commercial Zero-Turn mowers most landscapers use. They are fast, agile and mow perfectly at over 10 MPH! The Toro GrandStand is a good example of this class of mower. 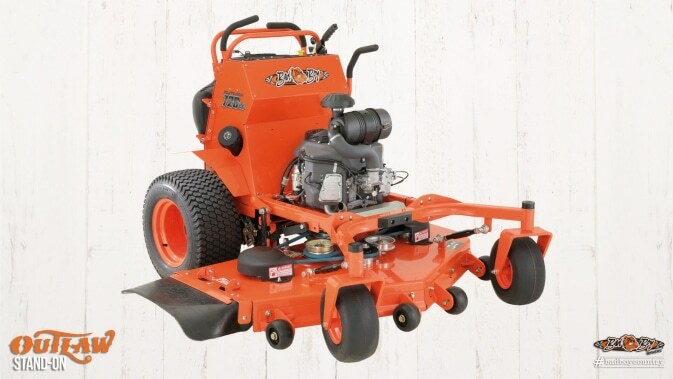 Production: 72 inches These mowers are true heavy-duty, large frame, high production mowers. Heavy frame, Big bore EFI engines. Some, like the Wright Stander® ZK even have dual rear wheels! 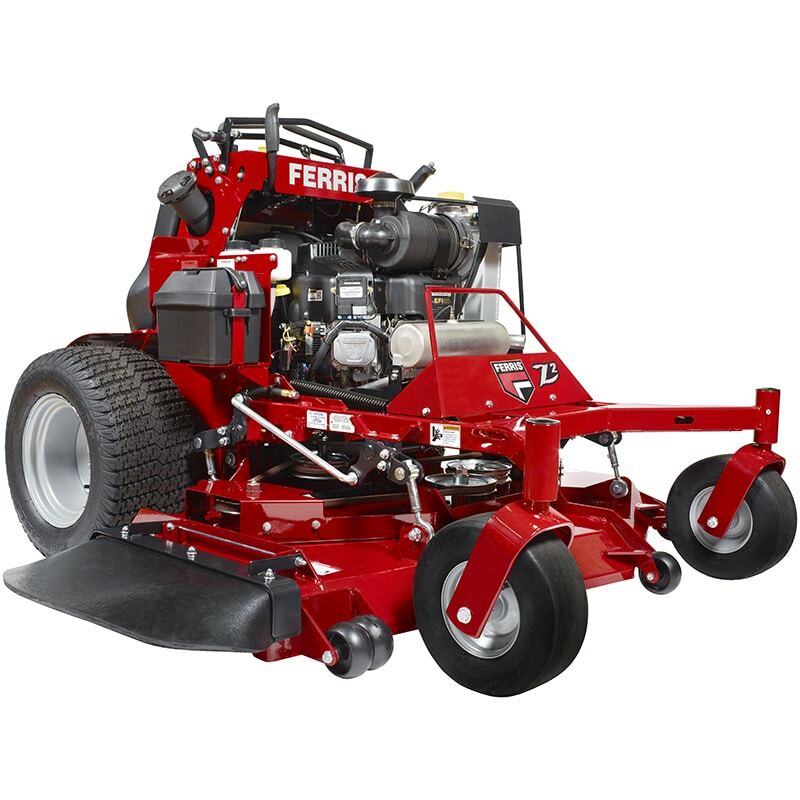 The result is the most productive and versatile large frame mower ever built. Big bore EFI engines provide power without compromising efficiency. High flow hydraulics propel high traction 23” or 24” tires for excellent hill holding, and dual-sided fuel tanks provide all-day run time. Take on your next season with a ZK. It’s the ultimate stand on mower. Period. NOTE! 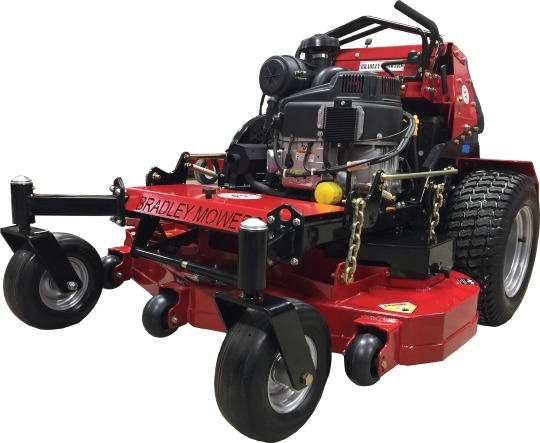 All stand on mowers with the exception of the Bradley are sold at dealers only. There are no Internet retailers or big box stores selling them at this time. Because of that, I suggest doing your research online for the best model for you but select a few brands that have dealers you trust close to you. Dixie Chopper: Stryker. the Dixie Chopper brand is officially gone but there are still dealers who may have this mower in stock. Havener Enterprises: Bradley Stand-on Compact ZT. 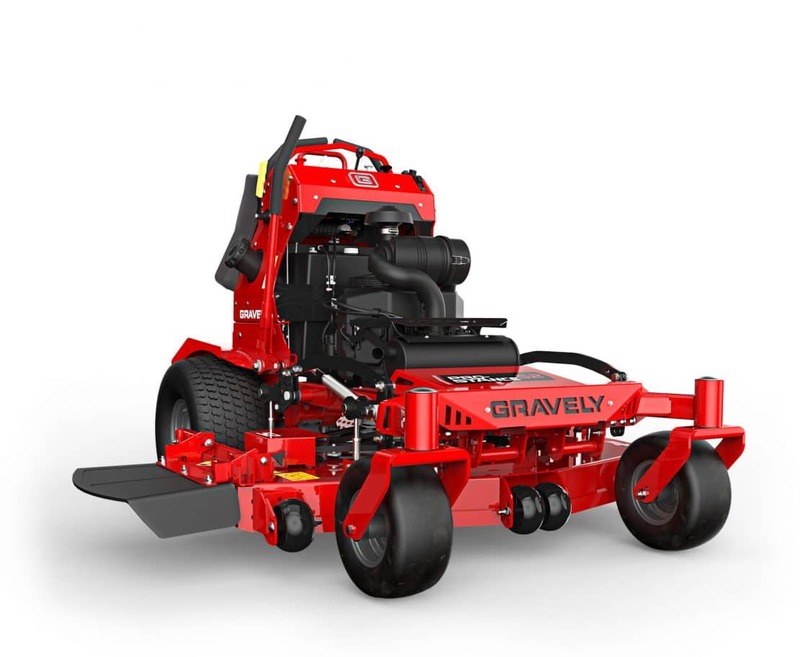 Note: The Bradley is about half the cost of all the other stand on mowers but it is still a commercial grade mower capable of giving you many years of service. 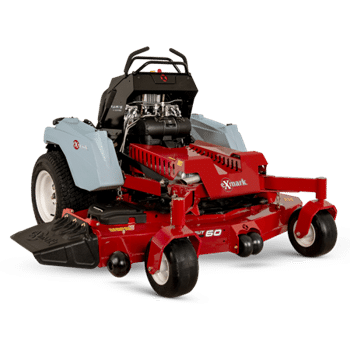 Havener Enterprises has been in business for 20 years and can sell these mowers for less because they do not have an extensive dealer network and they make their mowers in small batches so they don’t have the overhead costs of most other manufacturers. 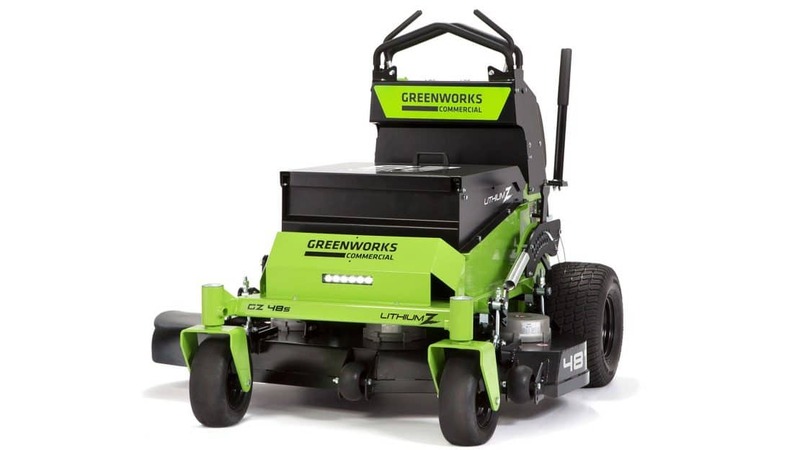 If you do your own maintenance this is one of the best value mowers on the market. If you need maintenance parts all you have to do is call them and the parts are quickly shipped out. Havener Enterprises: Bradley Stand-on Compact ZT.